INDIANAPOLIS, IN / ACCESSWIRE / November 10, 2018 / In honor of true American heroes, Learfield Licensing Partners again collaborates with '47 and Operation Hat Trick (OHT), a nonprofit organization supporting the recovery of wounded service members and veterans, to promote local military organizations on college campuses nationwide by honoring veterans in-game, creating a military scholarship and sending veterans prize packs. Twelve collegiate institutions that partner with Learfield Licensing (UAlbany, Army West Point, UC Berkeley, Campbell, Hofstra, Loyola Marymount University, North Dakota State, Northwest Missouri State, UNC Wilmington, Vermont and Western Michigan University) in conjunction with their own military appreciation football or men's basketball games, have aligned with '47 and OHT to honor veterans at games by donating hats to those veterans. Proceeds from the headwear sales will go directly to help dozens of organizations that provide direct services and support to wounded service members and veterans. "I am so very proud that Learfield Licensing schools have partnered with Operation Hat Trick to promote OHT on their campuses, in retail and through their advertising and social media channels," said Dot Sheehan, founder, and CEO of Operation Hat Trick. "By making a commitment to support the recovery of wounded service members and veterans, together we are making a difference, one veteran at a time. This year is very special for OHT. We honor Navy SEALs Nate Hardy and Mike Koch, to whom we've dedicated OHT to on the 10th anniversary of their deaths in 2008. We also celebrate $1 million in donations since 2014. Thanks to all who helped make this possible, we are honored." To help further support and raise awareness of OHT, Learfield Licensing, in partnership with Western Michigan University (WMU) and its Office of Military and Veteran Affairs, established an annual OHT Scholarship. 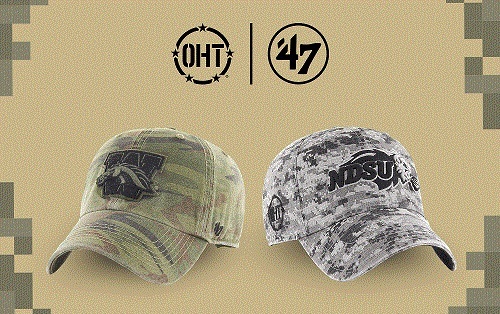 A portion of the proceeds of all OHT merchandise sold at WMU will help fund the OHT Military Scholarship, awarded each fall to a WMU student veteran. The winner of the first annual OHT scholarship was Paul Kidd, a Marine Combat Veteran and WMU student. He was recognized during WMU’s Salute to Heroes Football game on Thursday, November 1. "It was a pleasure and an honor to work with Learfield Licensing Partners, Operation Hat Trick, the WMU Office of Military and Veterans Affairs and Follett in order to generate a scholarship for a Western Michigan University student veteran," said Bob D'Amelio, Associate AD, Marketing, Licensing & Ticketing at Western Michigan University. "This is one of the most rewarding endeavors I have been involved with during my time at WMU. This program could easily be replicated across all campuses in the United States. To active and retired military personnel around the world, thank you for your service." Additionally, The University of New Mexico will deliver 20 OHT Hero Boxes, filled with OHT hats and other gifts, to patients at the Raymond G. Murphy VA Medical Center in Albuquerque, N.M.
Learfield Licensing assisted in the promotion of these events and products with customized in-store signage and social media graphics and videos. Social media giveaways involved tagging veterans who deserved to be gifted with an OHT Hero Box, a specially branded box with athletic tickets and the OHT hats inside. Schools using an OHT Hero Box include Army, Hofstra, New Mexico, Sam Houston State, UC Irvine, UTSA and Vermont. Learfield Licensing Partners, a trademark management agency specializing in licensing and branding, is a world-class licensing firm aligned with Learfield's history, strength and reputation. With industry-leading technology and a dynamic team of licensing and branding experts, we provide best practices and strategies to properly protect and promote our clients' brands and build partnerships that help our clients succeed, with resources and strategies for growth from Learfield. Learfield, which has a deep presence in the college athletics landscape, manages the multimedia and sponsorship rights for nearly 130 collegiate institutions, conferences, and arenas, and supports athletic departments at all competitive levels as title sponsor of the Learfield Directors' Cup. For more than four decades, Learfield has connected brands to the excitement, passion, tradition, fun and fans of college sports and now leverages multiple platforms and partnerships through distinct offerings through its affiliated companies. First established in 2008 at the University of New Hampshire (UNH), OHT started as a program that delivered free hats to wounded veterans in Veterans hospitals. The name Operation Hat Trick comes from the initial focus of hats, with a nod to the University's rich hockey history. The program was started by Dot Sheehan, the then Senior Athletics Director for External Relations, at UNH, as a way to honor local veterans. When tragedy shook UNH with the death of Navy SEAL Nate Hardy, son of a UNH professor and his wife, and Mike Koch, Nate's teammate and fellow SEAL, who died while serving in Iraq, Sheehan was inspired by the sacrifices made between the two friends and OHT launched itself onto the national scene with a business model that addressed a social need and the critical gaps and care that were not covered by the government or other agencies. OHT has an exclusive partnership with global sports lifestyle brand, '47, and other select licensees, academic institutions, sport leagues, retailers and corporations. A portion of every sale, "A Purchase with a Purpose," comes back to OHT who then makes donations to selected organizations that fulfill OHT's mission. To learn more about the story behind the cause, visit operationhattrick.com. '47 is a privately held sports lifestyle brand founded in Boston, MA, by twin brothers, Arthur and Henry D'Angelo in 1947. The D'Angelos were entrepreneurial pioneers who were quick to see the future of sports licensing by selling pennants and other sports memorabilia on the streets around Fenway Park. Through a combination of hard work, sound instincts and incredible passion, the brothers were able to grow their business from a single street cart to a premier sports lifestyle brand that uniquely melds sport and style. Previously known as Twins Enterprises, '47 is currently managed by Arthur's four sons, Bobby, David, Mark, and Steven. '47 is a proud partner of Major League Baseball, the National Football League, the National Hockey League, the National Basketball Association and over 900 collegiate programs and owner of Old Time Sports. '47 employs over 250 corporate and retail associates around the world and is headquartered in Boston and Westwood, MA. For more information, please visit www.47brand.com.